Two exciting events took place on Saturday, April 12, 2014, to honor Earth Day where tribal staff had an opportunity to help educate the surrounding public about Tulalip’s habitat restoration projects and treaty rights. The Allen Creek Quilceda Watershed Team (AQWA) hosted their annual Earth Day event at Wilcox Farms in Marysville this year. Several organizations including the Tulalip Tribes, Adopt-a-Stream, Snohomish County Conservation District, Earth Corps, Sound Salmon Solutions, Washington State Department of Ecology, City of Marysville Surface Water Management, and NOAA hosted educational booths to raise awareness of environmental issues affecting the region as well as providing tips and solutions for common problems. 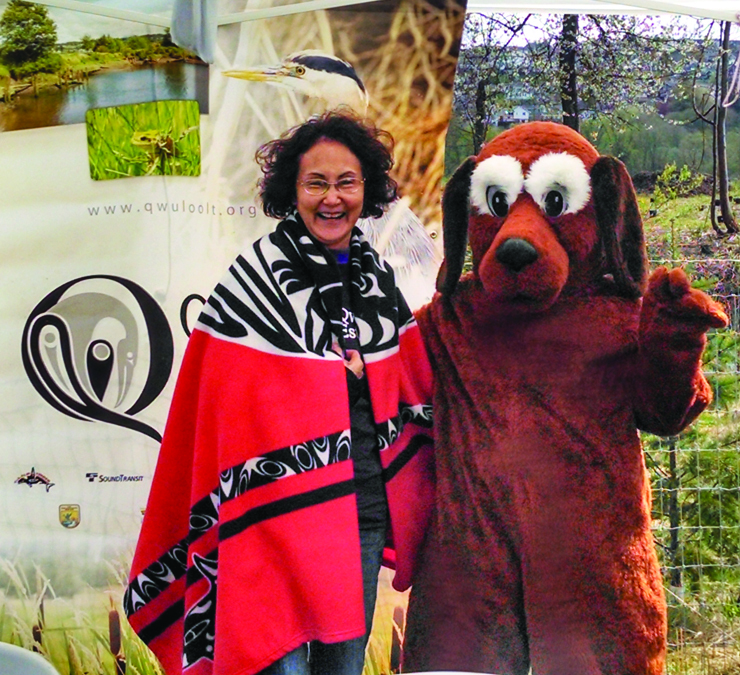 Tulalip hosted a booth on the Qwuloolt Estuary that included information on the history and future of the tribe’s biggest salmon habitat restoration project. Visitors also got to take away a purple t-shirt that displays the Qwuloolt logo. An important element to restoration work is planting the plants and trees that are native to the Snohomish watershed. Visitors enjoyed learning about the trees they were planting. This included Western Red Cedar, Sitka Spruce, and Douglas and Grand Firs, which, along with Alder make up Conifer forests. One of the more poignant messages that came through this year was the importance of picking up after your dog. If dog waste is left in the environment it compromises fresh water sources and salmon habitat. 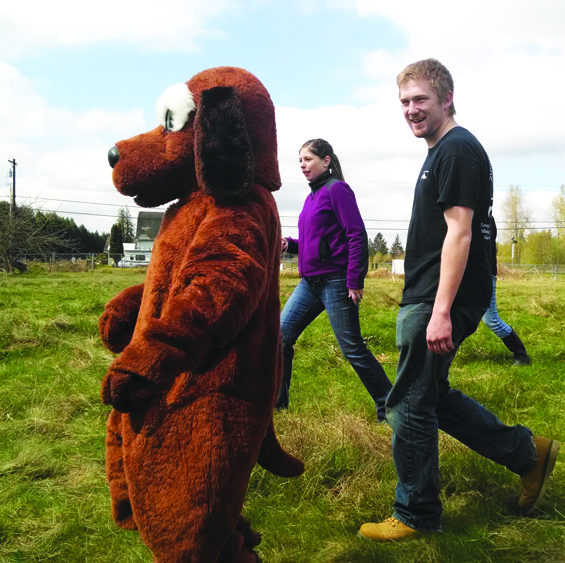 Dogs are our best friends but they need us to help make sure they are good citizens, said one eight year old Earth Day visitor, after meeting Scoopy Doo, who made a surprise appearance, thanks to Sound Salmon Solutions. The second event of note was hosted by the Tulalip Treaty Rights Office at the Hibulb Cultural Center for a group of 29 student advocates who are part of the Citizen’s Action Training School (CATS) for people engaged in Puget Sound issues. After completing fifty hours of training, where they become familiar with environmental challenges and various recovery projects, the student advocates will then volunteer at a variety of agencies and organizations that are working to restore environmental integrity to priority issues like shellfish, habitat, and stormwater runoff. The had already completed courses on Climate Change, Nearshore Ecology, Salmon and the Endangered Species Act, Forestry, Shellfish, Marine Mammals, and Water Quality before their trip to Tulalip. “This made for an interested and engaged group,” said Tulalip environmental liaison Daryl Williams. Williams and environmental policy analyst Morgan Ruff gave presentations on the history Treaty Rights as well as current environmental projects the Tulalip Tribes coordinating. Following the presentation the student advocates were given a tour of the exhibits at Hibulb and were very happy to learn about the culture and history of the Tulalip Tribes. The group then traveled over to the Qwuloolt Estuary site where they had the opportunity to see one of Tulalip’s biggest salmon habitat projects first hand. This entry was posted in Environment, Local News by Kim Kalliber. Bookmark the permalink.